The Polaris Slingshot, which is a reverse trike with two wheels at the front and one in the rear, is different than three-wheeled motorcycles. 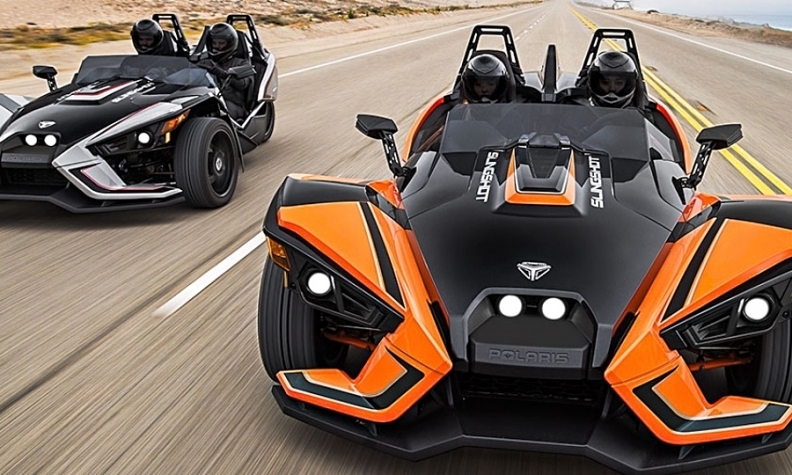 Transport Canada has issued a recall notice for about 1,400 three-wheeled Polaris Slingshot vehicles, eight months after Ontario passed legislation allowing such vehicles on its roads. Three-wheeled vehicles were already allowed on roads in Québec, B.C., Manitoba and Yukon. The Slingshot recall is due to potentially insufficient clearance between the fuel line and hood structure, which could result in damage to the fuel line and a potential fuel leak, Transport Canada said. A leak near the ignition source could lead to a fire, the agency warned. The recall includes all 2015-2017 models across Canada. On March 1, 2016, Ontario’s Ministry of Transportation introduced a 10-year pilot project that allows three-wheeled vehicles on provincial roads. The objective is to determine whether current licensing procedures work for the vehicles and whether they can blend with current traffic. The Polaris Slingshot, which is a reverse trike with two wheels at the front and one in the rear, is different than three-wheeled motorcycles. It has a steering wheel and other controls similar to that of a car as well as a sit-in passenger seat. Drivers need a “G” licence to drive one. The Slingshot has a 173-horsepower 2.4-litre four-cylinder engine that propels the vehicle to 100 km/h from rest in less than five seconds.